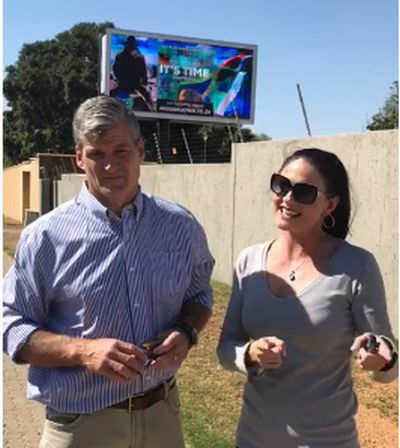 Former Springbok and managing director of Masimong Media Warren Brosnihan and Rochelle Maynard of Media Reign, in front of a digital billboard in Bryanston, on one of the busiest roads in Johannesburg, where they are displaying an advertisement for It’s Time Pretoria. Former Springbok rugby player and media company boss Warren Brosnihan issued a challenge last week to media and billboard companies to get behind the It’s Time Pretoria event on October 27 by sponsoring media space for what is expected to be the biggest prayer gathering ever seen in South Africa. And the response to his challenge at a media conference in Pretoria — which is part of an initiative by “Christians In the Industry” (CITI), a group of Christian leaders of media companies — has been magnificent with millions of rands of media sponsorship allocated to reaching millions of people, urging them to attend the prayer day for South Africa called by farmer evangelist Angus Buchan. The response to the billboard challenge has been amazing, said Piet van Rensburg of the It’s Time Pretoria organising team. Digital media is already in place reaching millions of people daily and they have been receiving phone calls from as far afield as Port Elizabeth in response to a video clip made yesterday, in which Brosnihan and media company executive Rochelle Maynard challenge people with media influence to use it to promote the prayer day. The taxi industry has responded massively to the billboard challenge, and is already promoting the event digitally at 15 taxi ranks and on 793 vehicles, reaching 2.5 million commuters daily, said Van Rensburg. And City Gates Media has erected a 600 sq m megastructure billboard — five storeys high and 50m wide on Pretoria’s N4 East highway just past the Hans Strydom offramp. The billboard went live this morning. Megastructure digital billboard on Pretoria’s M4 East highway. Not to be outdone by the digital media, printers are currently printing a million brochures, consuming 4 tons of paper and 1 000 litres of ink — and a distribution house is going to distribute all of them in and around Pretoria, said Van Rensburg. He said businesses have sponsored R5-million worth of exposure on billboards, taxi LEDs and other media in and around Pretoria. It is not only Christian businesses who are supporting the It’s Time Pretoria media campaign — secular companies have also caught the vision and are investing in the prayer event aimed at addressing challenges such as violence, hatred, racism and corruption facing the nation, said, City Gates Media boss Daryl Hardy who is a member of the CITI alliance of Christian businesspeople in media. In a video message released today Angus Buchan shares a word from the Lord on why it is urgent for people to attend the prayer event which some people are predicting will attract five million people to pray together. 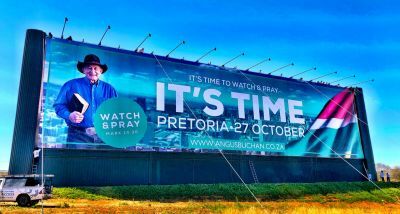 Visit www.angusbuchan.co.za for latest info on It’s Time Pretoria. It’s time, there is time, but there won’ always be. My heart bursts with joy at what the Lord is doing in SA. If you understand the story of Noah, you will understand that there comes a time when the Lord turns away, and then it’s done! 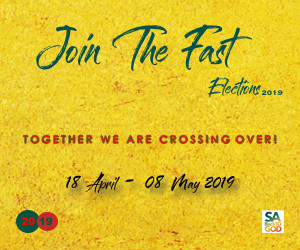 This is the season of repentance and it is the responsibility of ALL South Africans to go humbly before Him and to entreat Him to forgive our failures and to raise up leaders of integrity and faith who will re-establish the rule of law based on His Word. Amen and I believe He will do it. Our Survivor is alive and we must keep our live filled with rejoice and thankfulness. Amen. Praise the Lord!! may this event be “country shaking big” to His Glory and to the best of HIS WILL,for this country in need…in Jesus name Amen!